(Nanowerk Spotlight) Flexible electronics are all the rage these days. They promise an entirely new design tool like for instance, tiny smartphones that wrap around our wrists, and flexible displays that fold out as newspapers or large as a television; or photovoltaic cells and reconfigurable antennas that conform to the roofs and trunks of our cars; or flexible implants that can monitor and treat cancer or help paraplegics walk again (read more: "Flexible electronics could transform the way we make and use electronic devices"). Flexible electronics also might cost less to make. Conventional semiconductors require complex processes and multi-billion dollar foundries. Researchers hope to print flexible electronics on plastic film the same way we print ink on newspapers. Utilizing 3D printing, they could even be fully integrated into products. In terms of material selection, carbon nanotubes (CNTs) and graphene, along with hydrogen terminated amorphous-silicon, low-temperature polycrystalline silicon, semiconducting metal oxides and organic semiconductors, are promising candidates for flexible electronics. especially thin film transistors (TFTs) made of carbon-based materials such as graphene are expected to transform many technological applications. 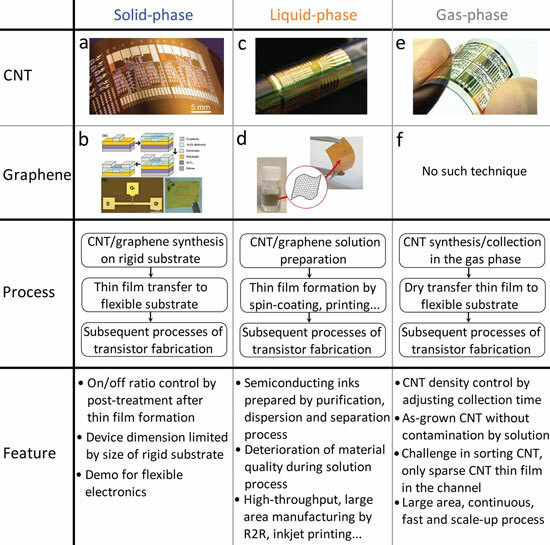 A recent article in Small ("A Review of Carbon Nanotube- and Graphene-Based Flexible Thin-Film Transistors") reviews the progress in single-walled CNT and graphene-based flexible thin-film transistors related to material preparation, fabrication technique and transistor performance control, in order to clarify the possible scale-up methods by which mature and realistic flexible electronics could be achieved. It highlights state-of-the-art all-carbon nanomaterial transistors and concludes that an all-carbon strategy is most promising to realize extremely flexible, stretchable and transparent electronics. The fabrication techniques for CNT- and graphene-based thin-film transistors can be divided into three categories – solid-phase, liquid-phase and gas-phase fabrications based on the different environments used for the production of CNT and graphene thin films. For solid-phase fabrication, CNTs or graphene supported on a solid and rigid wafer are detached from the wafer and transferred to a flexible substrate. For liquid-phase fabrication, CNTs or graphene dispersed in a solution is deposited on a flexible substrate by liquid-phase approaches including spin-coating, gravure/inkjet printing, nanoimprint, dielectrophoresis, etc. For gas-phase fabrication, a CNT thin film is formed in a gas-phase environment and directly dry-transferred to a substrate to make flexible devices. But at present, there are no such techniques reported for graphene. The key performance issues for thin-film transistors are large carrier mobilities and high on/off ratios for high-speed operation and low-energy consumption. The main challenge is a mixture of semiconducting and metallic CNTs in the conventional as-grown CNTs, while the absence of a bandgap is an obstacle for graphene. In their review, the authors address these issues in detail and describe current research efforts to improve performance of carbon-based TFTs. The final section of the review focuses on all-nanocarbon TFT devices: "Because CNTs and graphene thin films are excellent electrical conductors, they are promising for the practical production of transparent conductive films (TCFs) due to their unique electrical and optical properties. Compared to a transparent ITO TCF, a CNT- and graphene-based TCF has strong competitive advantages including a lower cost and better flexibility. Therefore, all-carbon thin-film transistors using CNT or graphene as electrodes are expected to enable the fabrication of high-performance, flexible, transparent and stretchable devices using relatively simple and low-cost techniques." Concluding their review, the authors stress that the most urgent task at present is to fabricate flexible, stretchable and transparent electronics by using a high-throughput, low-cost, and industrial scale-up technique, rather than conventional semiconductor manufacturing in the laboratory.